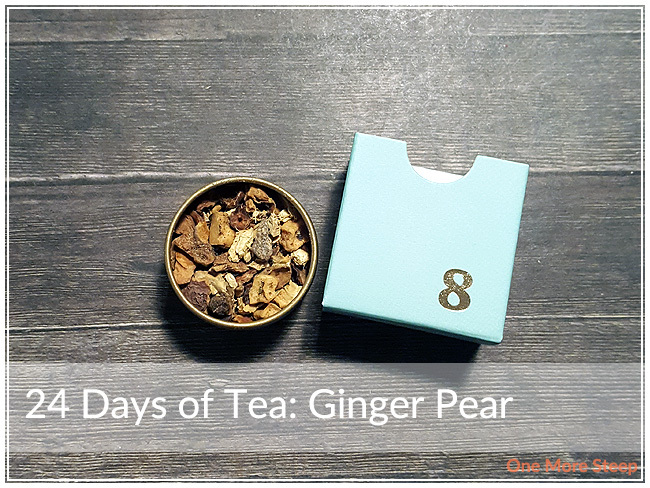 Day 8 of the 24 Days of Tea calendar is Organic Ginger Pear, and let me tell you that the smell of this dry tea smells exactly like it’s labelled on the tin – ginger and pear. I found with this tea, and a lot of the other teas that have big chunks, is that the tea base itself ends up settling to the bottom of the tin so when I first looked into it all I saw were the dried pieces of ginger and pear. But after digging into it a bit, there was the white tea leaves, so that wasn’t too disconcerting. Organic Ginger Pear is made up of: ginger, apple, cinnamon, white tea, pear, rosehip, and natural quince, pear, apple, and cinnamon flavouring. DavidsTea recommends steeping Organic Ginger Pear in hot water (75-80°C/167-176°F) for 4 to 7 minutes (both on the packaging and on the product page). If this was purely just the additives, I’d be inclined to agree, but there is a white tea base. White teas are generally steeped for 2-5 minutes. I steeped Ginger Pear for close to 3 minutes. 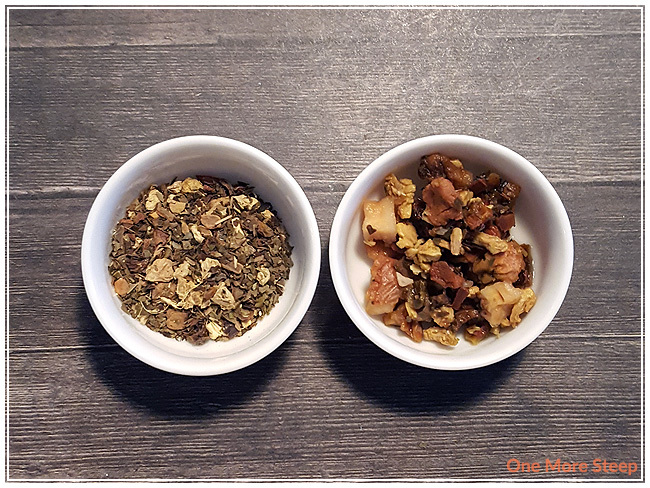 I have a page here on One More Steep about steeping times for various types of teas. While Ginger Pear is steeping, there’s this really nice warm ginger aroma to it that just wafts up. It has a lovely light orange colour, and it just smells good. On first sip, I was pleasantly surprised that I could taste the pear as I couldn’t smell it very well as it was steeping. The ginger flavour just lingers pleasantly on the tongue as I drank this tea. 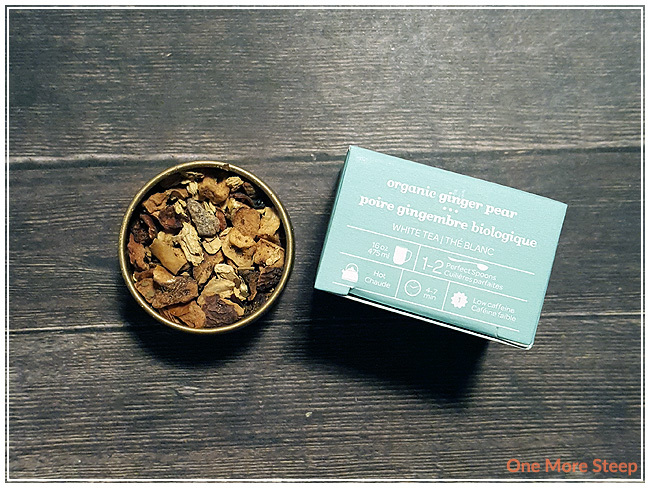 There’s a subtle natural sweetness, that I would attribute to all the fruit that’s in this tea blend, that partners well with the ginger. I don’t think that this tea really needs additional sweetener at all. I tried one more steep of Organic Ginger Pear. I found with the second steep that there was a bit of a flip in the flavour profile. The ginger was stronger the second time around than the pear, although that was still present as well. There’s less sweetness to the tea as the ginger’s spiciness begins to crowd out and overpower the other flavours. I liked DavidsTea’s Organic Ginger Pear. I think it does fantastic for a single steeping to get the full ginger and pear flavour profile. 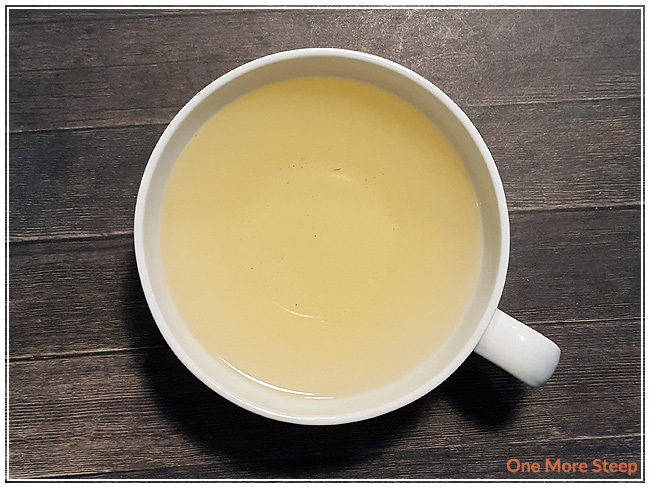 If you’re a fan of ginger, I think you’ll also enjoy subsequent steeps with this tea. I would hesitate to recommend following the steeping directions set out by DavidsTea as 7 minutes would be far too long for a tea with a white base. It is a very tasty cup of tea though, and I really enjoyed the ginger and pear pairing.